Starting a Band | Learn English and use English chat at English, baby! At some point in your life, you probably wanted to be in a band. It’s a common dream for people, young and old. 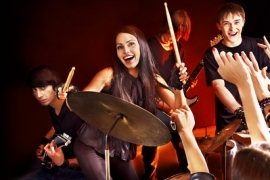 Teenagers often practice their guitars or drums after school and on weekends, hoping to get good enough to form a band with friends. Some even write their own music. After all, being in a band is cool. Only a few, rare bands make it big, though. And every band’s story is different. Some bands play together for years before getting a record deal. Some bands are in the right place at the right time, and suddenly they’re famous. It’s hard to know if and when a band is going to find fame and fortune. Gary wants to start a band, but is he doing it for the right reasons? Find out in today’s English lesson about being a rock star. Gary: So, I have this really important thing that I need to ask you about, Marni. Marni: Yeah, what is it? Gary: A friend of mine plays guitar. Gary: I can sing. I’ve got a drummer. And we’d really like to make it big as a band. Marni: OK, well, I think it’s great that you want to start a band. But maybe shooting for fame and fortune isn’t the best approach. Gary: OK, OK. A big thing… we want to go on tour. We want to see the world. We want some groupies. You know. Marni: I think you need to get into this because you really love playing music. You guys don’t want to be a one hit wonder. Gary: Of course. We love playing together. It’s a lot of fun. We want to tour. So, I think what I need from you is: should we, or shouldn’t we? Should I give you a tape or a CD to listen to? Marni: I guess I caution you on just having that be your goal. When I was in a band, it was just because we loved playing together and we loved making music. And we didn’t care if we sold lots of records, or toured, or had groupies. We just wanted to make music. Gary: I appreciate that. Thanks. Marni: But I’ll listen to your tape. Gary wants to start a band. He has a guitarist and a drummer, and Gary can sing. His band is excited to play music in different cities, maybe even in different countries. In Gary’s opinion, it would also be OK if the band got some groupies! He wants advice from Marni who has been part of a band before. She thinks that Gary shouldn’t start a band if his goal is to become famous and make a lot of money. Marni tells Gary that he should only be in a band if he’s doing it because he loves to make music. He appreciates her advice, but it seems like the most important thing to Gary is to make it big. Do you or did you ever sing or play in a band? Why do you think that people are so interested in becoming musicians? Gary asks Marni, ”... should we, or shouldn’t we? Should I give you a tape or a CD to listen to?” He uses a modal verb. Should expresses obligation, as in, “I should study for my math test,” or probability, as in, “The package should arrive tomorrow, since I sent it last week.” It also gives advice, as in, “I think you should go out with Jesse.” Gary uses the modal verb should because he wants Marni’s help, and he knows she can’t give him advice if she’s never heard his band’s music. It’s raining outside. Use a modal verb to tell your friend what to wear. Why does Gary want to be in a band? He wants to go on tour. What is Marni’s advice for Gary? Start a band because you want to meet women. Start a band because you like to make music. Start a band because you can be rich. Start a band because you can be famous. Which is not a modal verb? See the full English lesson at English, baby!